For much of this week, I took notes from a seat in a room while somebody else stood before me and others to deliver a lecture about one subject or another. It was a bit like college–except I used a laptop instead of paper, I was never unplugged from the outside world, and there was the prospect of getting paid for what I wrote about those talks instead of Mom and Dad paying for me to attend them. 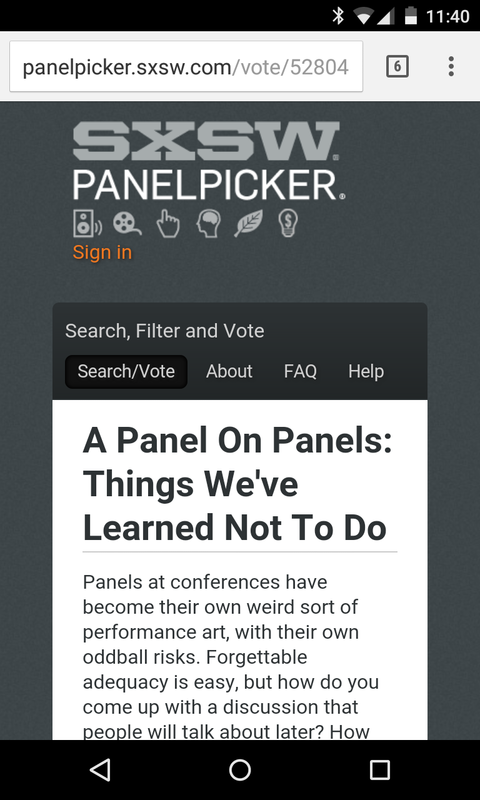 For the past couple of years, I’ve talked about pitching a SXSW panel about nothing other than the weird performance art that is participating in a panel discussion. I finally went ahead and wrote up a proposal, featuring me as well as ACT | The App Association’s Jonathan Godfrey and Tech.Co’s Jen Consalvo. Please vote for it, if you’re so inclined; if it gets a spot on the SXSW program, you’re welcome to show up in Austin and ask a question that’s more of a comment. I answered a few questions from the news station about VzW’s switch to no-contract prices without phone subsidies–speaking via Skype on some iffy conference WiFi. How scratchy did I sound on the air? I’ve had “write a post about the intellectual-property implications of the Trans-Pacific Partnership trade deal” on my to-do list for a while, and the leak of a much more current draft gave me a reason to turn that into an actual column. Something tells me this won’t be among my most-read stories this month, but it’s a post I had to write. I spent most of Tuesday, Wednesday and Thursday at the USENIX Security Symposium in D.C., which gave me a chance to attend Jeremy Epstein’s entertaining and enraging autopsy of the incomprehensibly insecure voting machines on which I cast my ballot for over a decade. This post got a spot on the Yahoo home page over the weekend, in case you’re wondering how it racked up 665 comments. This is the column I’d meant to write last week–and could do this week when the reader who’d sent the e-mail I couldn’t find re-sent that message after reading about my holdup here. This entry was posted in Weekly output and tagged ACTA, intellectual property, Jen Consalvo, Jeremy Epstein, Jonathan Godfrey, panels, sxsw, TPP, unsubsidized phones, Usenix, Verizon Wireless, Virginia, VzW, Winvote by robpegoraro. Bookmark the permalink.